Hi and thanks for peeking. The challenge this month was to use felt and I've made 2 cards. 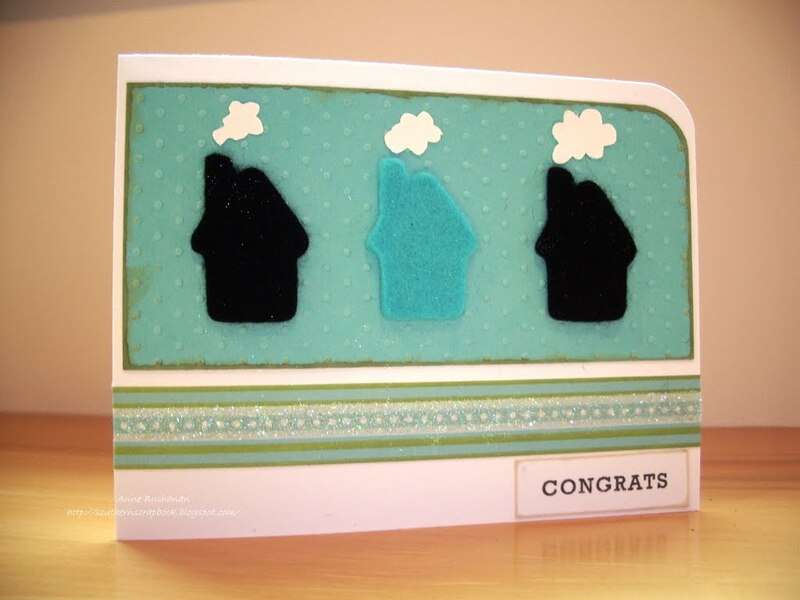 The second card is a congratulations card for a friend who just bought a new house. I designed the house using SCAL (super easy - just weld a square, triangle and rectangle together). Used a strip of paper from the Green Boutique pad and scor-tape to create the glitter strip. both of your cards are amazing.. love what u've done! Great job. I love both cards, but those flowers are so cute! Love those flowers with the stitched edges! What a great idea! I LOVE the flowers! What a great idea to sew around the edges! Love the stiching around the flowers. Both are adorable - really love the stitching around the flowers! Great job on both of them! Love the houses you created using SCAL. I just got the deep cut blade to try cutting felt with my Cricut too. Great job! The felt houses are so cute! And the stitched flowers are so striking too! 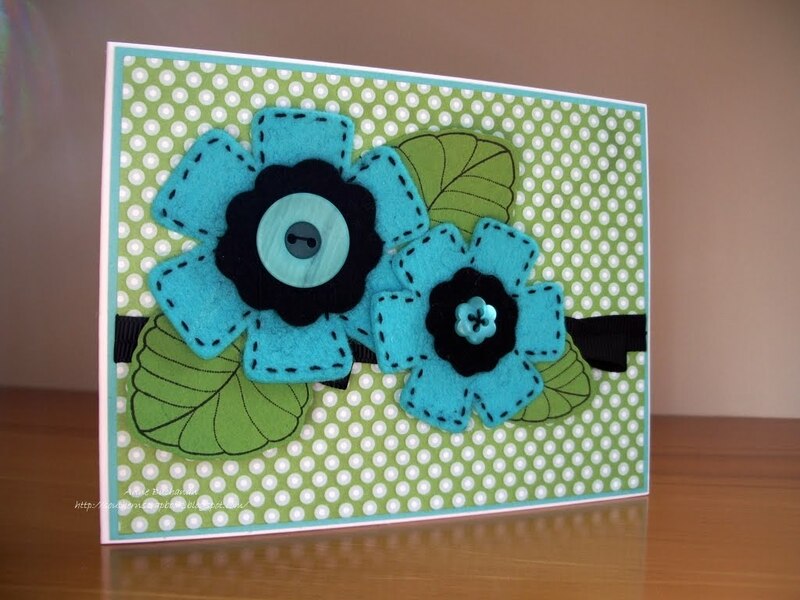 Your stitching around the flowers is such a neat idea! I immediately thought "wow, I like that"!! They're both great cards. The flowers are just awesome. The stitching around the edges makes them unique and special. Both cute cards! Love the DB background on the first! Oh! 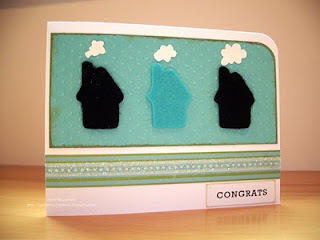 Cute little houses and great job stitching on the felt, especially with the black on blue, so striking! Very cute!!! I sooooo love the color combos. Both cards are fantastic! I love your colors. Both cards are wonderful! The stitching on the flowers is a wonderful detail! Very cool! So clever to just make your own :) Hey Anne, I have a question or, well, a request. I am making a mini album for my boyfriend's birthday and (it's one of Cosmo Crickets blackboard albums) it only has 6 pages, so I made some more pages for it - but... the regular hole punch my host family has doesn't reach far enough. I do have a Crop-a-dile at home in Germany, but not here in Auckland. So basically, I was wondering whether you could somehow help me. It's really just punching some holes into cardstock, that's all I need... I hope you're fine in rainy Auckland and have a good day! Very cute! I like the Hawaiian shores flowers with black stitching! THOSE FLOWERS ARE AMAZING!! Just awesome! Great job using the Cricut. Gotta love that bug. Great colors and thoughtful new home card. Thanks for sharing. I work full time but enjoy crafts in my 'spare' time. I love card making and scrapbooking but also dabble in mosaics and quilting.